Railpictures.ca - A.W.Mooney Photo: Gads!! Nippy !!! No doubt the severity of winter in SW Ontario, notably nasty around the Stratford area, played havoc with the fledgling GEXR operations. I’m assuming this BN 3080 was ‘on loan’ to help the railroad get thru the winter, as they were only running with 4 GP9s back in these early days. I still remember this day vividly, and it was a lot more bitter than it looks. The second unit is GEXR 177. | Railpictures.ca – Canadian Railway Photography – photographie ferroviaire Canadienne. Caption: Gads!! Nippy !!! No doubt the severity of winter in SW Ontario, notably nasty around the Stratford area, played havoc with the fledgling GEXR operations. 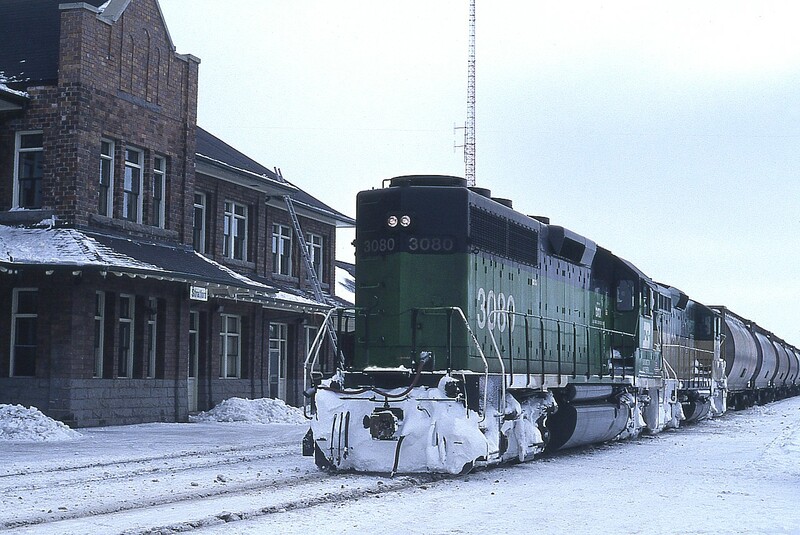 I'm assuming this BN 3080 was 'on loan' to help the railroad get thru the winter, as they were only running with 4 GP9s back in these early days. I still remember this day vividly, and it was a lot more bitter than it looks. The second unit is GEXR 177.